Chessington’s historic Burnt Stub Mansion pre-dates the theme park and zoo by several hundred years, having been originally built in the 14th century. 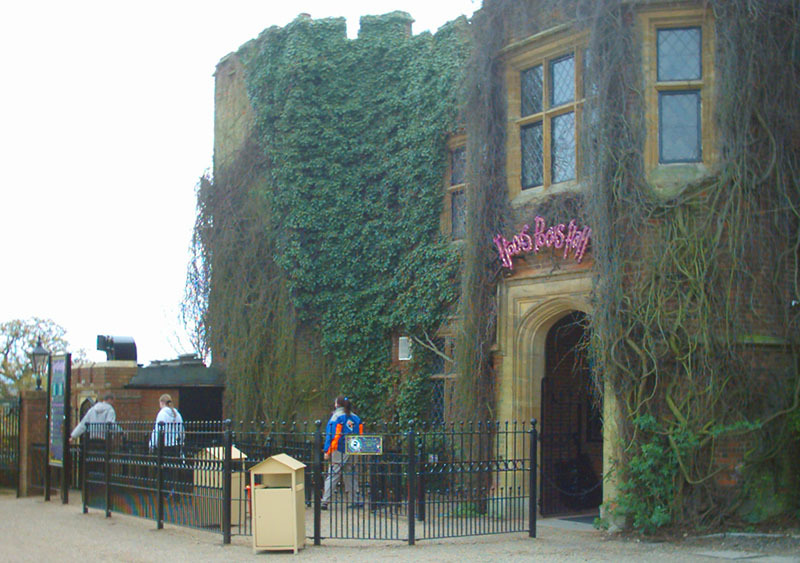 In 2003 it became home to a wizard and his group of cheeky goblins, as Hocus Pocus Hall opened its doors. The attraction was a themed walk through that visitors would experience with the aid of “magic glasses” which made some of the painted theming elements appear to be 3D. Along with a range of animatronics which brought the goblins and wizard to life were several interactive hands-on activities. The grand finale was a mirror maze that guests had to find their way through to make it back outside into the open air. The journey through Hocus Pocus Hall began at the entrance doorway where 3d glasses were handed out. Guests were ushered into the Entrance Hall where a short film featuring the wizard was played, explaining what lay ahead. Of course, one of the mischievous goblins soon started causing chaos and forcing the wizard to wave his wand to cast a spell. The lighting in the room changed to expose goblin eyes looking out from the walls, and a bookcase slid back to reveal a secret passageway. Down the passageway was the library and a giant spinning tunnel which made guests feel they were being turned upside down as they walked through it. 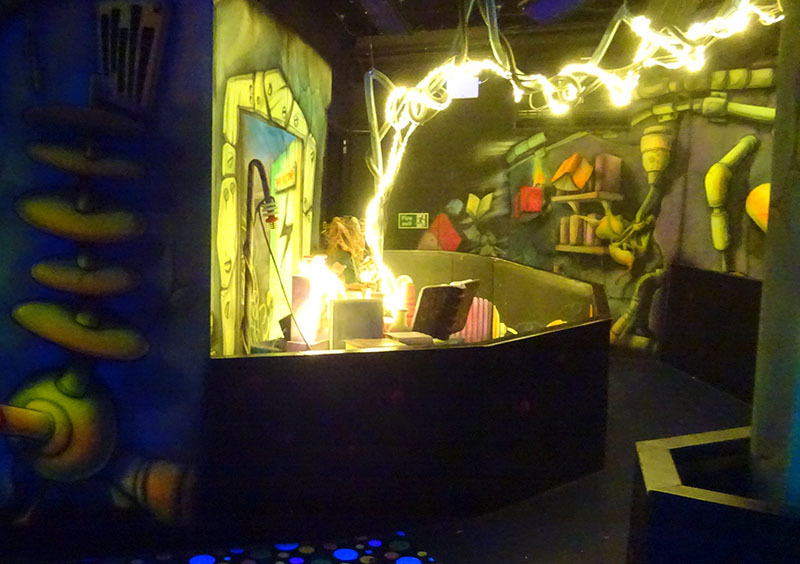 This is one of the classic fun house style illusions, but Hocus Pocus Hall’s version was particularly effective with the colourful blacklit paintings spinning around. The next room featured the goblins causing trouble, and guests were encouraged to get involved pressing buttons, standing on pressure pads and putting their hands into holes for a range of surprises. After navigating over a pit of snakes, which would fire puffs of air as guests walked across, visitors encountered one of the firm favourite parts of the attraction – the farting chair. As people sat down in it, the chair would emit a loud farting sound. There were quite a number of different noises on offer! Through the wizard’s bedroom and down another corridor, over an infinite pit illusion painted onto the floor, guests encountered another video of the wizard who instructed them to remove their magic glasses before entering the mirror maze. The maze itself was quite small, but fairly disorientating unless visitors knew the secret: there was a line embedded into the floor which could be followed to lead straight through the maze. It was quite fun to go through with people who didn’t know about it, then run off leaving them fumbling about in the middle of the maze bumping into the mirror walls! Hocus Pocus Hall was a fun diversion with some nice interactive elements. 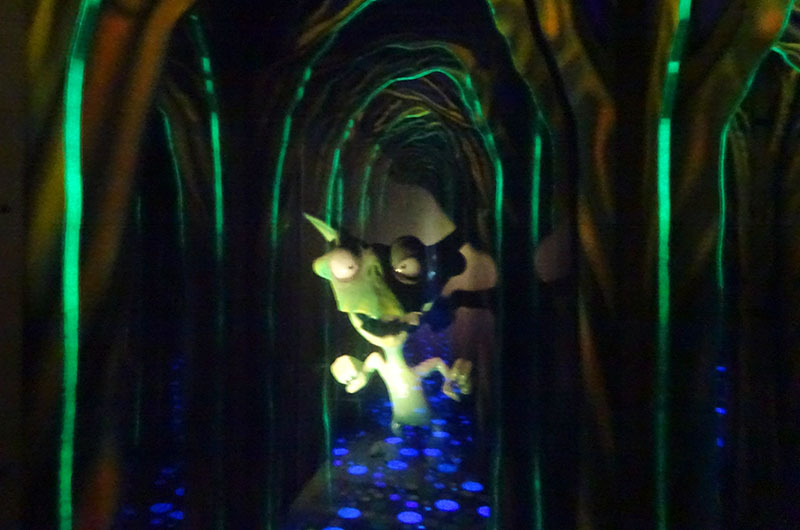 It never felt particularly high budget with its plywood walls covered in blacklight paint, but it was always enjoyable to walk through with a group intent on having a good time. As with many attractions of its type, Hocus Pocus Hall began to look a little shabby toward the end. Some of the interactive elements stopped working, the ‘glass’ floor over the snake pit became increasingly opaque, and the 3D glasses were done away with in 2017 which stopped visitors appreciating all the three-dimensional paint effects. The Hall shut its doors for the final time at the end of the 2018 season, replaced by Room on the Broom in 2019.